The Planning Committee shall be responsible for developing and publishing the CCC Annual Activities Calendar and implementing the Annual Planning Meeting for the CCC. The CCC Annual Planning Committee Meeting shall take place in January or February of the previous year being planned for. The Budget Committee shall be responsible for developing and maintaining the annual budget for all CCC activities and expenditures and shall submit final annual budget for approval to the CCC general body. Final annual budget presentation and approval shall take place at the January general body meeting of the CCC. The Communications Committee shall be responsible for advertising to and corresponding with all Member Units of the CCC on all activities of the CCC. The Fundraising/Activities Committee shall be responsible for planning and implementing fundraisers and other activities hosted by the CCC. g) Submitting final report of each activity after completion, including gross revenue, profits, loss and an activity evaluation to the CCC not more than two (2) months after the event has taken place. The Resolutions Committee shall be responsible for developing and submitting to the CCC for support and/or approval, revisions to the CCC By-Laws; WSD By-Laws/Guidelines and the National KPC Constitution, By-Laws, Standing Rules and Guidelines. c) Developing support for the passage of resolutions or any other changes to the KPC Constitution/By-Laws/Guidelines/Standing Rules; WSD By-Laws/Guidelines and the CCC By-Laws. This will allow members to be rotated into and out of the committee every three (3) years, thus providing continuity and consistency. The Claver Fund Committee shall receive all information and inform the CCC general body monthly on Claverite members and clergy who are ill, in the hospital, having surgery or who have passed away. The charitable fund of the CCC shall be known as the CCC Claver Fund. The Claver Fund Committee shall evaluate all requests for CCC Claver Funds from members and/or units in the CCC and recommend or disapprove, to the CCC general body that a disbursement of funds be made. The Claver Fund Committee shall make recommendations to the CCC general body on charitable contributions to give in general on behalf of the CCC. Each individual Knight and Lady whose Council or Court is a member of the CCC shall be asked to donate $1.00 per year that will go directly to the CCC Claver Fund. The donation shall be collected by the Council or Court and a separate check shall be disbursed by the Council or Court, made out to the CCC Claver Fund, which represents each member in their Council or Court paying the donation for the year. This donation is due in January of each year. 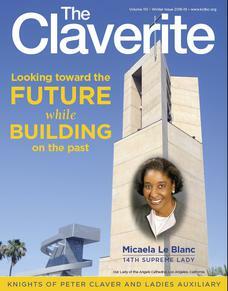 For a request to be eligible from a unit, 75% of its members must participate in the Claver Fund. The Directory Committee shall be responsible for producing, distributing and maintaining the CCC Membership Directory of all members of the CCC. The Coordinating Jr. Branches and Courts Committee will be organized for the purposes of supporting the Junior Division in the CCC area. Participating Jr. Branches and Courts will combine efforts and resources to obtain joint goals. Each member musts be fingerprinted with a file at their own Diocese/Archdiocese.